Director/Screenplay – Christopher Nolan, Producers – Christopher Nolan & Emma Thomas, Photography – Wally Pfister, Music – Hans Zimmer, Visual Effects Supervisor – Paul Franklin, Visual Effects – Double Negative (Supervisors – Pete Bebb, Rob Hodgson & Andy Lockley), Lidar VFX & New Deal Studios Inc, Special Effects Supervisor – Chris Corbould, Production Design – Guy Hendrix Dyas. Production Company – Warner Brothers/Legendary Pictures/Syncopy. Cobb is one of the world’s top Extractors, he heading a team of industrial espionage experts that create dream environments inside someone’s sleeping mind so that they can enter and steal their secrets. After an Extraction on the Japanese businessman Saito occurs with problems, Cobb and his team receive an offer from Saito – to enter the dream of the heir to a rival corporation and plant an idea that will inspire them to break up his father’s empire. Stating that the idea is dangerous, Cobb is nevertheless drawn to take the assignment in return for Saito’s offer to clear him of the charges of murdering his wife Mal that have caused him to become an international fugitive from US authorities. To implement the plan, Cobb recruits young Ariadne to design a dream maze. Ariadne is intrigued by Cobb’s background. She realises that he keeps the memory of Mal alive in his dreams but that his subconscious causes her to constantly intrude and this presents a risk to the operation. They plan to place the corporate heir Robert Fischer, Jr into a deep drug-aided dream state during a plane flight where they will create several dreams within his dream. Each dream will progress down to a successive level below that will cause time to be slowed to the point that months and years can take place subjectively during a normal sleep period. However, once inside Fischer’s dream, they find their carefully prepared plan unravelling due to the defences that have been built into Fischer’s subconscious and from the random intrusions of Mal who is determined to sabotage the operation. At the start of 2000s, British director Christopher Nolan made an amazing appearance from nowhere with his second film, the thriller Memento (2000) featuring Guy Pearce as a man whose memory keeps resetting. Memento was an arthouse/festival hit and presaged great things to follow from Nolan. Nolan’s subsequent English-language remake of the Swedish thriller Insomnia (2002) disappointed somewhat on that promise. Nolan however regained his feet with the double-punch of Batman Begins (2005), his revival of the cinematic Batman franchise, and The Prestige (2006) about warring magicians, which showed him as a director with a strong and intelligent grasp of cinematic craft. The Nolan cult culminated with the runaway success of his second Batman venture, the brilliantly driven The Dark Knight (2008), which gained a massive critical and fan following. Inception was Christopher Nolan’s seventh film. It came with a huge buzz of anticipation that called it “The Matrix (1999) of the 2010s.” Initially, I thought this was the inane hyperbole of media publicists reaching for a vaguely similar hit of recent memory onto which they could slap a label of comparison, however The Matrix comparisons are not inapt. Christopher Nolan admits that he first came up with the idea for Inception ten years before at the point when films like Open Your Eyes (1997), eXistenZ (1999), The Matrix and The Thirteenth Floor (1999) had just come out but he did not have the filmmaking experience then to be able to pull it off. The similarities go further – like The Matrix, Inception stars a former teen heartthrob actor as he moves into his thirties and attempts to define himself in cult edgy roles; both films are about outlaw hackers caught inside a labyrinth of reality and illusion where winning is about mastering the art of manipulating the illusion; and while The Matrix had the sublime cool of Bullet Time moves, Inception has slow-motion combat in zero gravity. 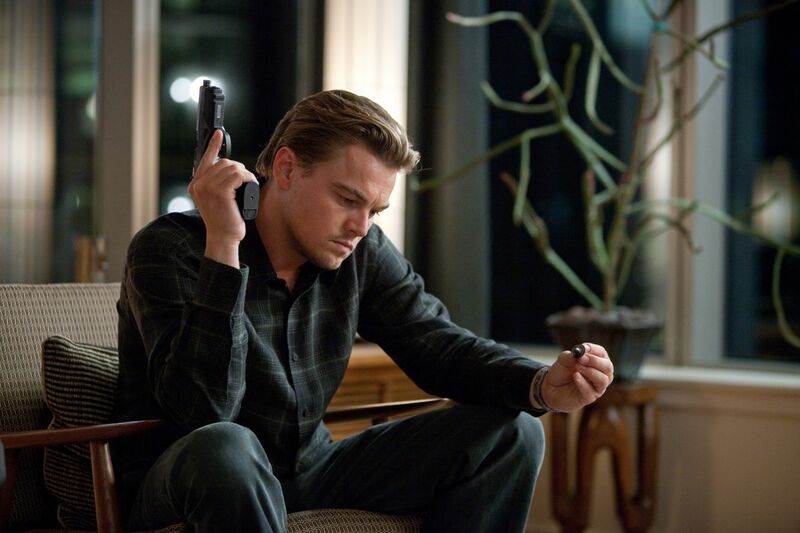 The other film that Inception bears some comparison to is Shutter Island (2010), the Leonardo DiCaprio vehicle of five months earlier, where he played a very similar character caught up in a series of illusions where he is not sure what is real and is unable to prevent visions of his dead wife, about whose death he holds much guilt and responsibility, from reappearing. There have been a number of films about people who have the ability to enter into dreams. The first of these was in The Electronic Monster/Escapement (1960) and was followed by the likes of Dreamscape (1984), The Cell (2000), Nightmare Detective (2006), Paprika (2006), not to mention a number of subsequent films that were influenced by Inception such as Vanishing Waves (2012), Mindscape (2013), Real (2013), Incarnate (2016) and Lucid Dream (2017), even something as capriciously silly as Michel Gondry’s The Science of Sleep (2006) or the A Nightmare on Elm Street films. Most of these become vehicles to display an array of surrealistic effects. However, Christopher Nolan takes Inception way beyond the surrealistic montages these others operate on and builds an amazing conceptual thriller wound through multiple layers of artificial reality. Nolan does that rare thing that good science-fiction writers do. He asks a big what if of his premise – a device, not unlike The Cell, where people can enter into other’s dream states – and then creates a fascinatingly detailed world with its own set of rules and proceeds to complicate that with all manner of twists. 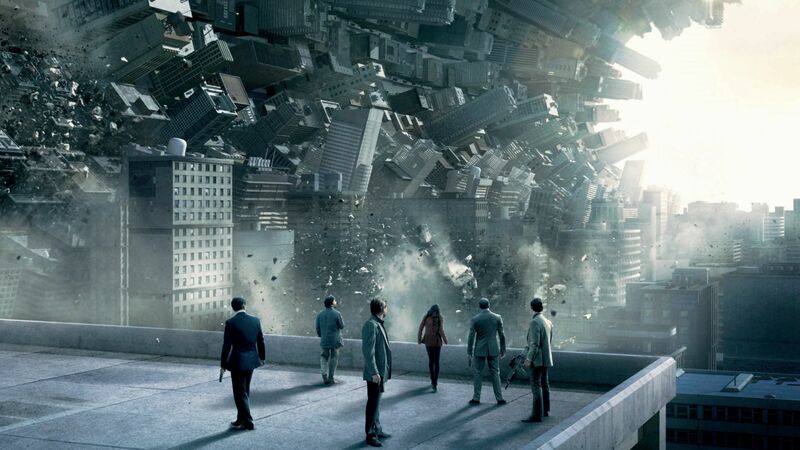 When most science-fiction films these days are centred around explosions and big displays of CGI effects, Inception is one of the few science-fiction films that remains a work of ideas – and that can only be a good thing. Nolan piles ideas upon ideas until Inception becomes a labyrinth of dazzling conceptual ingenuity. The initial scenes with the extraction into Ken Watanabe’s subconscious, which come with multiple flips between different layers of dream without any signposting of which, not to mention the mysterious appearances of Marion Cotillard, is confusing to everybody who is seeing the film for the first time. It is the first signal that Christopher Nolan is grasping at massive ideas and not wasting time pandering to anybody not capable of keeping up. Subsequently, Nolan gives us an amazing scene where he introduces us to the rules of the dream world through the eyes of Ellen Page where Leonardo DiCaprio first pulls back from the Parisian street cafe to let Page realise that she is in a dream and then the city and streets around her start to disintegrate as she panics, followed by her mastering of the dream, bending the city’s architecture around on itself, creating mirrors that open into street scenes and pop-up bridges, before the people that inhabit the dream turn like white blood cells and mob her. The inception scenes that occupy the bulk of the film take place on multiple levels of dream state where in each the team are pulling Cillian Murphy into some caper scheme, while at the same time are dealing with attacks by his subconscious defences – this is a film where lines like “His subconscious has been militarised” are tossed off with sublime cool (and perfect sense). What happens in one dream state affects the physics of the level beneath – the hotel being rocked by quakes during the car chase and then plunged into a zero gravity zone as the car falls off a bridge, even the amusing suggestion that it is perpetually raining in the world because the dreamer’s subconscious is reminding him he forgot to go to the bathroom. It is positively ingenious watching the way everything is wound around to allow the elaborate scams to fall into place. 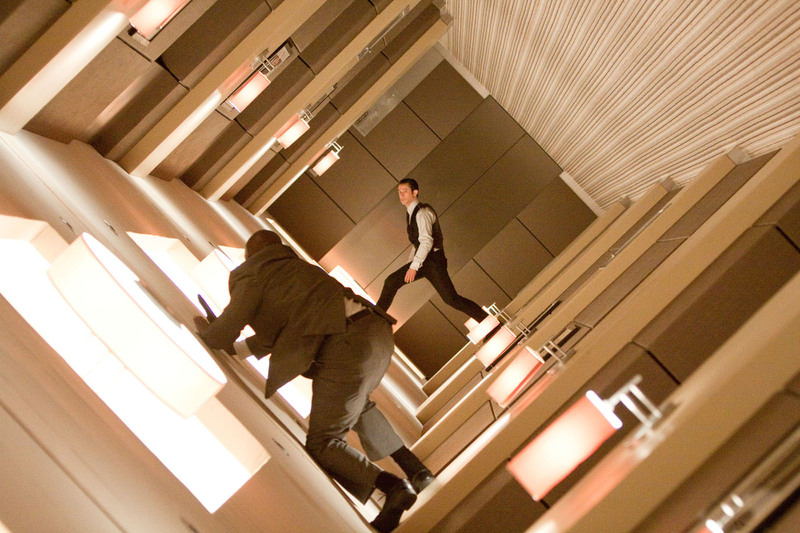 Nolan directs some dazzling scenes with Joseph Gordon-Levitt engaged in zero gravity fights with subconscious goons in a hotel corridor with them bouncing off the walls and swimming along an upside down hallway, or of Gordon-Levitt manoeuvring a stack of sleeping dreamers into a lift. One of the things that strikes about Christopher Nolan’s ventures into genre material is that he is a resolutely realist director – his Batman films eschew graphic novel poses and the more fantastical elements of the Batman mythos in favour of a character and action-driven realism. Similarly with Inception, Nolan for the better part dispenses with the idea of the dream terrain as a world of Dali-esque marvels that has dominated the cinematic depiction of dreams ever since Alfred Hitchcock’s Spellbound (1945) and makes it a realistically grounded world. It is not a world where the impossible is constantly happening, rather it is centred around the mundane stuff of car chases and people on skis shooting at one another. Take many of these scenes on their own and it would be hard to guess they are meant to exist in a dream world as opposed to a standard action movie. There are several surreal elements in Inception, many of which featured prominently in the trailer – the scenes bouncing of the walls of a hotel hallway in zero g, the city bending, the cliffs disintegrating – but what is notable is that this is not principally what the film is about. Primarily, Inception is a film where the wonder comes in the richness and mind-stretching capacity of its ideas, as opposed to it piling on visuals (something you could accuse The Matrix of and of which The Cell entirely consisted). It is indicative that the most beautifully written part of the entire film – the story of Leonardo DiCaprio and wife Marion Cotillard and their descent into a world of their own beneath multiple layers of dream within dream that stretches a standard sleep cycle out to fifty years, her inability to cope with reality after leaving and the revelation of the cause of his subsequent guilt – is one that takes place without any visual effects or action scenes. [PLOT SPOILERS]. The film also reaches a superbly ambiguous ending where Leonardo DiCaprio rescues Saito from his dream, which carefully weaves back into the start of the film with the two talk about predestiny, leaving you wondering if everything that has transpired has not been another dream in Leonardo DiCaprio’s mind and we have simply not returned to the topmost dream state encasing all of this. In the final scene, not unakin to Blade Runner (1982)’s unicorn dream ending, Leonardo is reunited with his children and Nolan closes in on his totem top spinning on the table as it gains a slight wobble but cutting to black before it topples, leaving the question of whether we are still in a dream beautifully unstated. Inception is parodied in Scary MoVie (2013). Next up for Christopher Nolan was his third Batman franchise outing The Dark Knight Rises (2012), the space exploration film Interstellar (2014) and the non-genre War film Dunkirk (2017). Nolan also produced and devised the story for the Superman reboot Man of Steel (2013) and produced Transcendence (2014), Batman V Superman: Dawn of Justice (2016) and Justice League (2017). (Winner for Best Film in this site’s Top 10 Films of 2010 list. Winner for Best Director (Christopher Nolan) and Best Original Screenplay, Nominee for Best Actor (Leonardo Di Caprio) and Best Supporting Actress (Ellen Page) at this site’s Best of 2010 Awards).